Key to this project was determining the right proportion of small front lot to three-story Victorian. Inspired by the homeowners’ love of the Portland Japanese Garden, the design features woodland plantings and a collection of large boulders for the kids to climb on. Natural strips of stone to match the boulders were installed to break up large, zig-zagging swaths of concrete. In back, the view from every level of the house offers an inviting playspace for young and grownup alike. 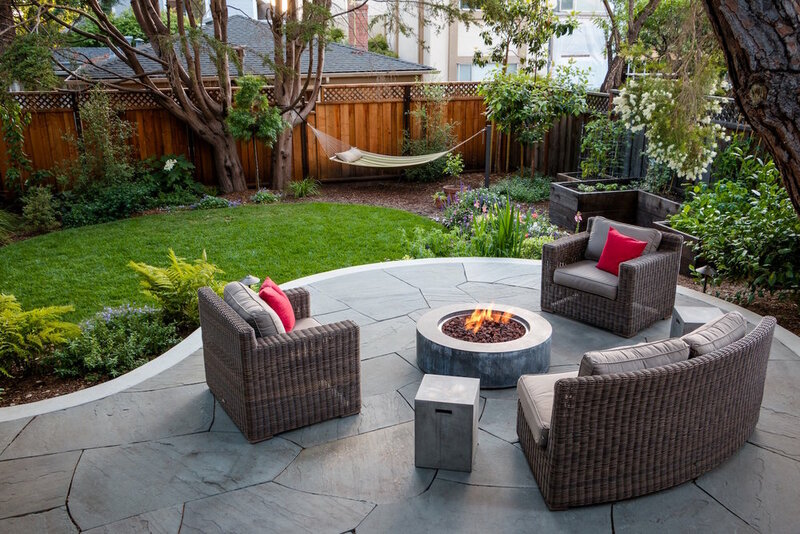 The concrete patio achieves a harmonious separation of space vertically, its surface an inlay of cut natural stone that showcases a cozy gathering space complete with fire pit. Mature trees create a sense of enclosure and fuel the woodland feel year round, while in spring, Azalea, Rhododendron and flowering bulbs put on quite a show.